Milton Keynes Dons have signed Leeds United defender Paul Butler on loan until 2 January. The 34-year-old former Leeds skipper has fallen out of favour with new manager Dennis Wise and was told that he could leave Elland Road. 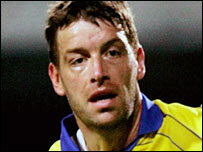 The former Republic of Ireland international has amassed over 600 appearances in his career, including two seasons in the Premiership. Butler had been linked with a move to Macclesfield to team up with Paul Ince.